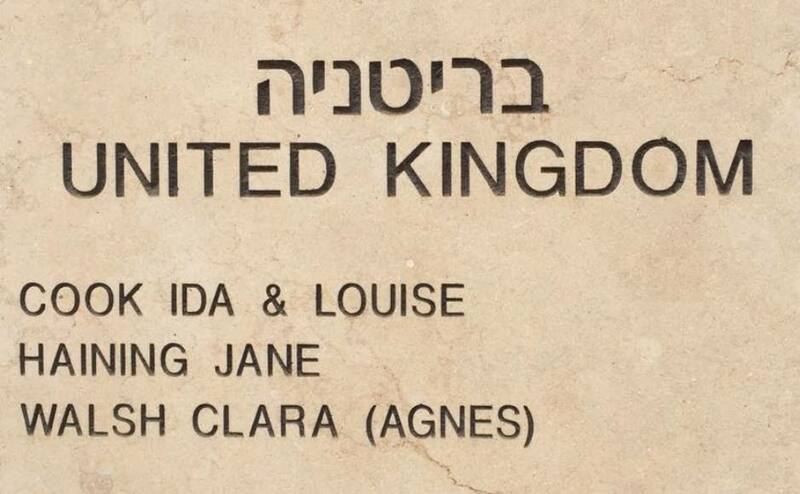 The Moderator of the General Assembly of the Church of Scotland has paid tribute to a missionary who gave her life to help protect Jewish schoolgirls during the Second World War. 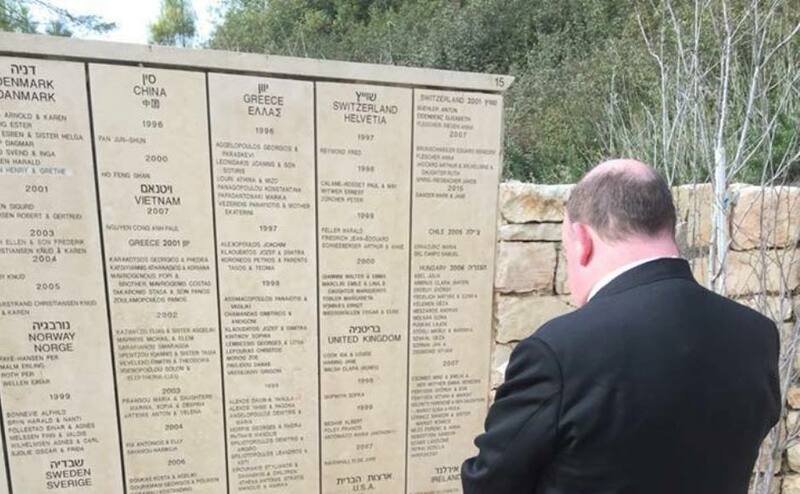 Right Rev Dr Derek Browning honoured the memory of Jane Haining at Yad Vashem, the sacred Holocaust memorial in Jerusalem where she is the only Scot to be named Righteous Among the Nations. Dr Browning pays his respects to Kirk missionary Jane Haining who is the only Scot to be named Righteous Among the Nations. Miss Haining, who grew up near Dunscore in Dumfries and Galloway and worked as a matron, was recognised for helping Jews during the Holocaust. She was arrested at the Church of Scotland girls boarding school in Budapest in Hungary in 1944 and eventually taken to the Auschwitz Birkenau extermination camp where she died at the age of 47. 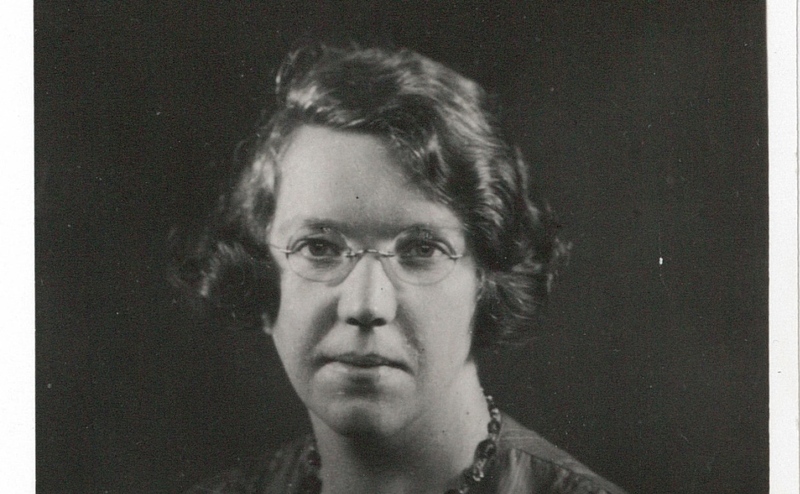 Jane Haining was arrested in Budapest in 1944 and eventually taken to Auschwitz where she died. Dr Browning said: “Near the memorial at Yad Vashem are rosemary bushes, for remembrance, and Scots Pines. 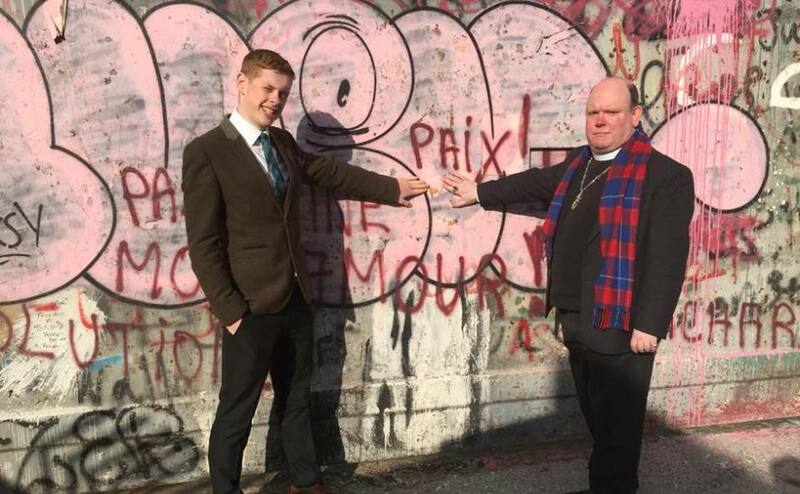 Robin Downie, Moderator of the National Youth Assembly of the Church of Scotland, also paid his respects to Miss Haining’s memory yesterday. He and Dr Browning followed the Jewish custom and left a stone at the wall where the missionary’s name is written. Jane Haining is a unique figure in Scottish history. Holocaust Memorial Day, a national commemoration day dedicated to the remembrance of those who suffered in The Holocaust, under Nazi Persecution, and in subsequent genocides in Cambodia, Rwanda, Bosnia and Darfur, is on Saturday. The Moderator is currently on an official visit to Israel, Palestine and Jordan to meet with Church of Scotland colleagues and partners. Dr Browning and his team have met many people of different faiths over the last week including Zoughbi Zoughbi and his family and colleagues at Wi’am, the Palestinian Conflict Transformation Centre in Bethlehem. Wi’am are involved in education, job creation, non-violent resistance and mediation, working particularly with women and children. The centre aims to improve the quality of relationships and to promote peace, justice, a culture of acceptance and reconciliation in the community. The delegation visited Aida refugee camp which is just behind Wi’am. It has been in existence since 1950 – initially comprised of tents and now permanent buildings. Dr Browning said: “We stood at one of the many walls in Israel/Palestine that runs through properties. “I was left wondering who was being kept in and who was being kept out since the different sides in this ongoing conflict are in some form of prison. Dr Browning and his colleagues met with Rabbi Michael Melchior, President of MOSAICA (The Middle East Religious Peace Initiative) who is also the Chief Rabbi of Norway. The Moderator said:“His vision stems from a biblical belief that everything we do in our lives should come from recognising God’s image and holiness in all and that holiness and peace are the tasks we should pursue in the faithful life. Dr Browning and his colleagues spent time with the Nasser family at the Tent of Nations on Saturday morning. They have owned the land they farm since the Ottoman Period. Dr Browning said: “The farm is located in the middle of a number of Israeli settlements, and is constantly under pressure from the state and military authorities, who dispute their (documented) claim to the land. “Land is an issue for both Israeli and Palestinian as is justice. “A place to belong is an issue for both Israeli and Palestinian and peace is a necessity. On Sunday, Dr Browning was the guest preacher at St Andrew's Church in Jerusalem, which is a large and diverse congregation representing many nations and traditions. Following the service, the Kirk delegation travelled to Bethlehem and passed through Checkpoint 300, one of the main crossings between Palestine and Israel. Each morning thousands of people queue to get through to their workplaces in Israel. Dr Browning said: “Some have travelled an hour before they even get to the Checkpoint, and queues can be anything from 30 minutes to a number of hours. “Many people face a commute to work but not like this. 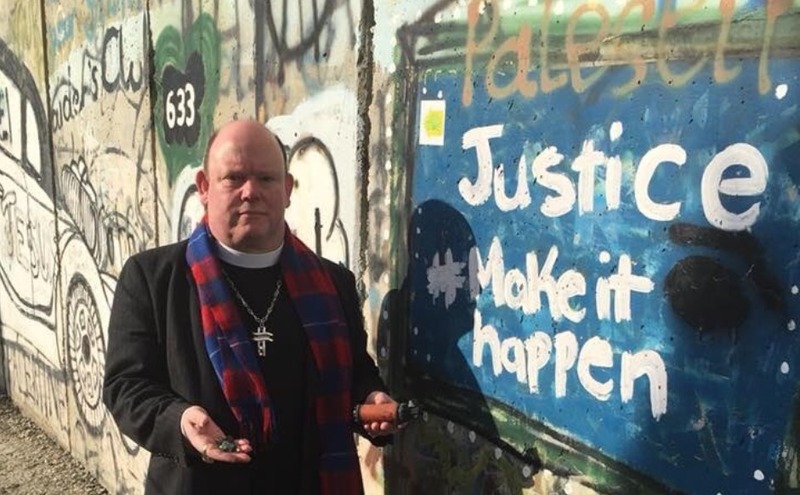 Dr Browning, who has visited sacred sites like the Western Wall, sometimes called the Wailing Wall, also met with Dr Bernard Sabella, Executive Secretary of the Department of Services for Palestinian Refugees, which is part of the Middle East Council of Churches. George Stephan, forum coordinator of ACT (Action of Churches Together) in Palestine, also attended the meeting. Dr Browning said: “We think of refugees as people who are forced from their homes and having to travel great distances. “In Israel/Palestine, a refugee may be only a few miles from their home, in the next village or town. “In the situation in Israel Palestine there are many voices in what is a complex political, economic, social and theological challenge. “How can we in Scotland hear the many voices, all wishing to speak their own truth, and how can we discern it? “We talk of one narrative but there are many stories of hurt on many sides. Dr Browning visited The Holy Land Handicraft Cooperative Society, the town of Beit Sahour and the Field of Shepherds chapel in Bethlehem. 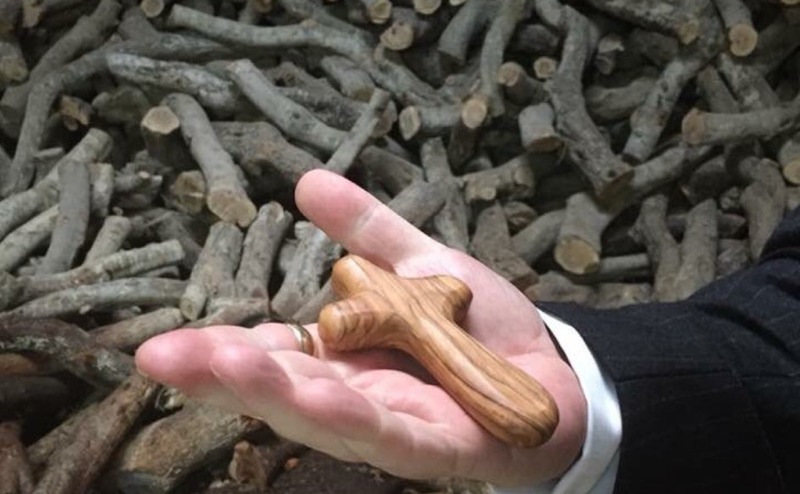 The family-run cooperative make the holding crosses and larger crosses from olive wood that the Moderator has being giving to people as gifts. Dr Browning sees where crosses he is giving out as gifts are made. Dr Browning said: “It was an emotional moment for me. “These crosses made from olive wood from Nablus, crafted in Bethlehem the place of Nativity, but in the shape of the cross that speaks of Calvary and crucifixion and Resurrection. “It is like holding Christmas and Easter in your hand. 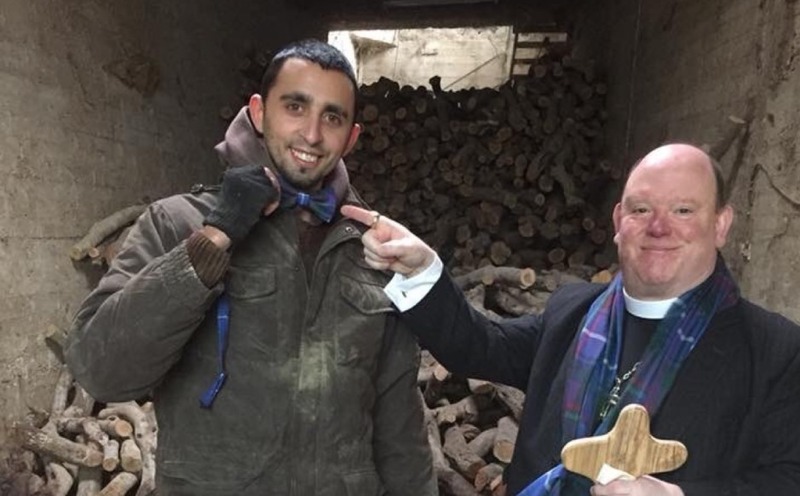 A Church of Scotland tartan bow tie for a Holy Land Handicraft Cooperative worker. 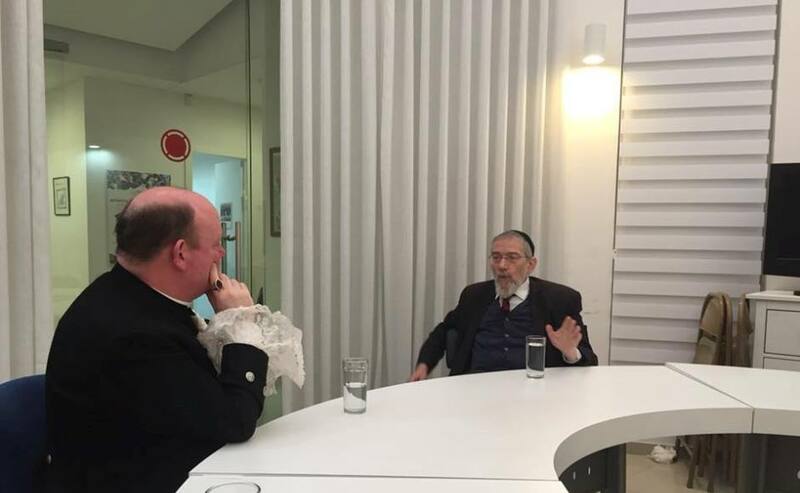 Dr Browning has held talks with Rabbi David Rosen, director of Inter-religious Affairs at AJC, a global Jewish advocacy organisation. Among the various awards and recognition he has received, Rabbi Rosen was granted a Papal Knighthood in 2005 for his contribution to Jewish-Catholic reconciliation. In 2010, he was made a CBE by the Queen for his work promoting interfaith understanding and cooperation. The Moderator said: “It is fascinating to enter into conversation with people from the Jewish tradition who are willing to speak openly and candidly about the opportunities and challenges that face the constantly evolving situation in Israel and Palestine, and what this means for us in Britain. “The rabbi made me think of our churches here in the Holy Land not as 'ex pat' congregations but as peoples who are 'at home' in the place where our faith tradition had its birth. Dr Browning has also met with Scottish Jews in Israel and visited the Palestinian Presidential Palace in Ramallah for a meeting with senior representatives. 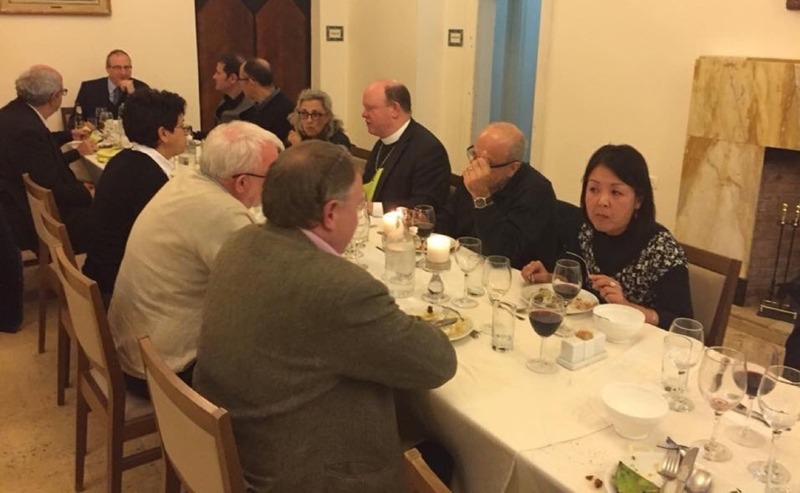 Dr Browning is hosting a series of interfaith dinners with Church partners during his visit.